Ijen Crater, Mt Bromo, Madakaripura Waterfall Tour 3 Days is combination nature tourism in East Java, Indonesia have mostly recommended for foreign visitors due to have high popularity. these 3 tourism objects categorized in Mount Bromo tour 3 days 2 nights that possible reached from Surabaya City, Malang and Banyuwangi. 3 Days Tour Mount Bromo, Ijen Crater, Madakaripura Waterfall mostly started from Surabaya in the morning and finish at afternoon or evening. If You can not take this time, You can read other tour package that suitable with your time arrangements. detail itinerary for Ijen Crater, Mt Bromo, Madakaripura Waterfall trekking package, You can read below. Our driver will pick you up according your arrival location by private AC (air conditioned) Car or Van then take You to your hotel or Homestay around Cemoro Lawang for 3,5 hours. Arrive in Cemoro Lawang, Stay 1 night. 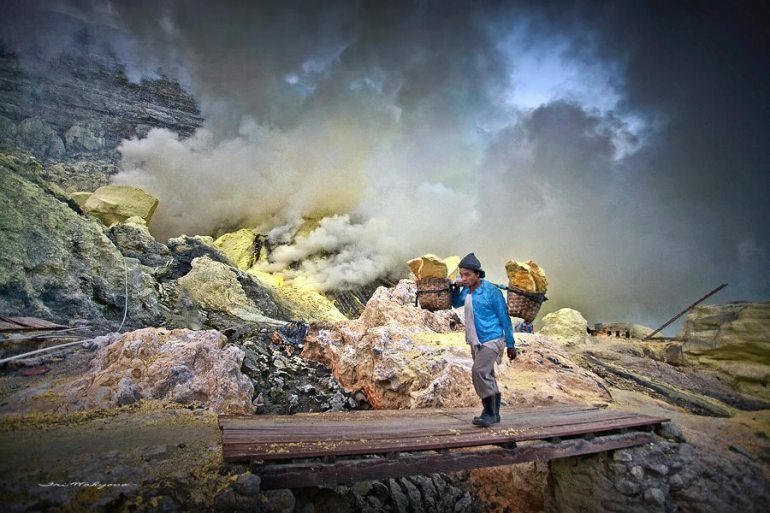 Reach the Ijen volcano rim, Do photography for Ijen volcano crater views such as Blue Flame Ijen Crater, Green Acid Lake, Sulfuric Ijen Crater Dome with yellowish color, Local Miners activity loading sulfur from bottom crater. Finish enjoy Ijen Volcano Trekking, Comeback to Paltuding (Ijen Crater Parking lot) for 2 hours then return to your hotel or You can directly Continue to Hotel near Mount Bromo for 6 hours (along your trip, You can stop for lunch in Our recommendation restaurant). Get your Hotel, Stay 1 night. Wake you up at 02.30 AM for preparing, take shower then start visit Pananjakan (the highest peak) using Private Jeep 4 WD for 30 minutes. Finish enjoy all views, comeback to your jeep and continue to Mount Bromo Crater by stop at sea of sand then start Mount Bromo trekking for 30 minutes or using horse riding transportation. Get Madakaripura Watefall parking lot, take motorcycle for 10 minutes to trekking start location and do trekking for 30 minutes using slipper accompanied by local guide. Get the Madakaripura waterfall location, You can take picture for Madakaripura Waterfall views while make swim around 1 - 2 hours, then comeback to your Van / Car through same route. Before You take Ijen, Mt Bromo, Madakaripura Waterfall Tour Package 3 Days, Hope You make your reservation preparing within 1 - 2 months before because these tourism always heavy visitor. We are the Private trip organizer very possible organize the private group trip from Surabaya, Malang or Banyuwangi and finish according your request. for detail Mount Bromo tour package, Accommodation and other facilities, You can visit Our contact.